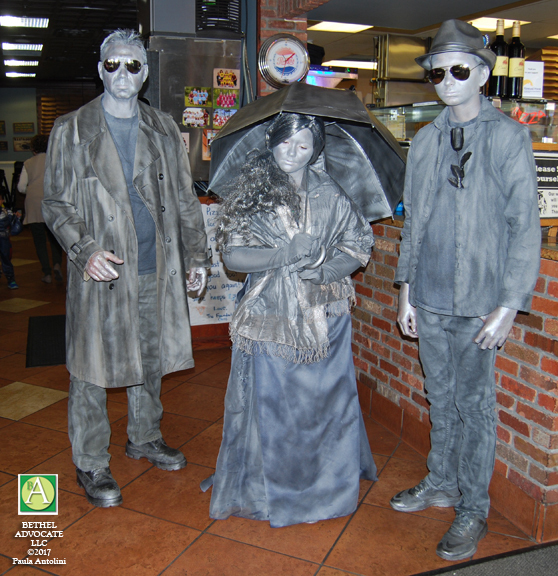 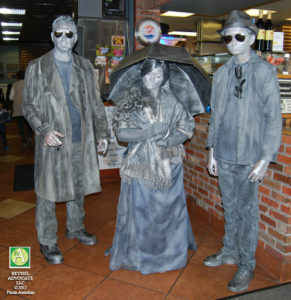 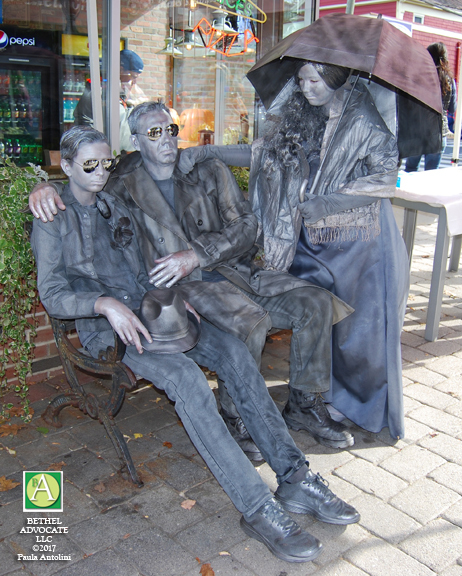 Photo: An entire family sits frozen like statues, amazingly covered in silver grey, head to toe including the umbrella, clothing, shoes and faces, outside Famous Pizza at 1 P.T. 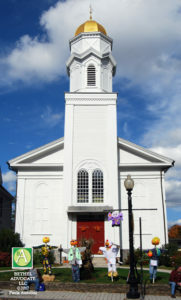 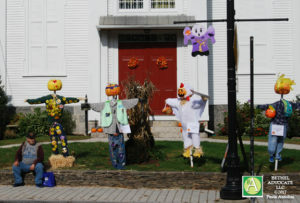 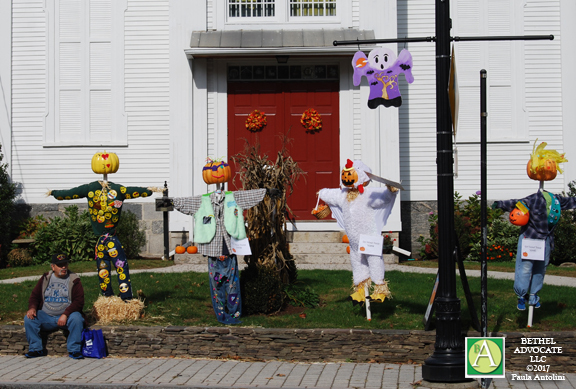 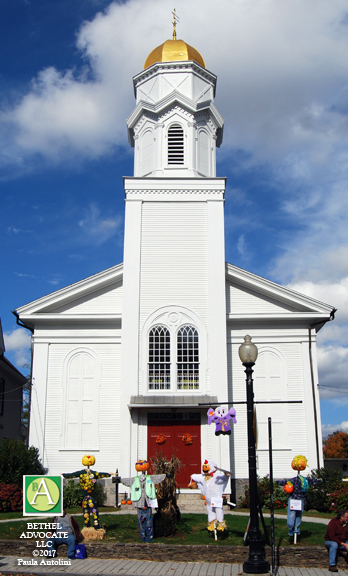 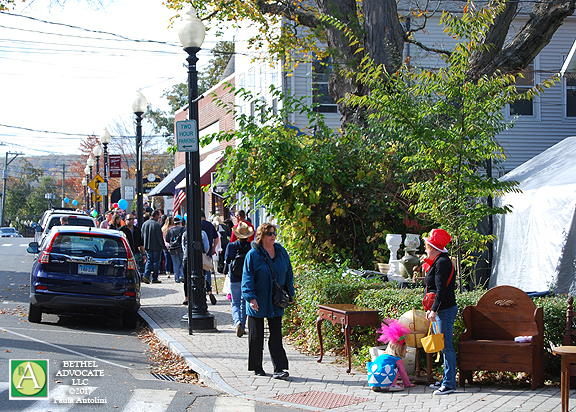 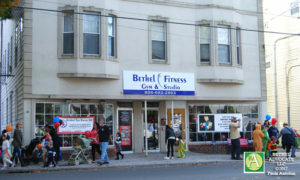 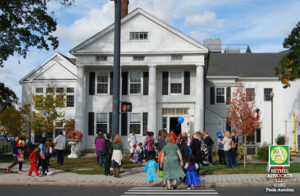 Barnum Square, during Trick or Treat Street on October 28, 2017, Halloween weekend. 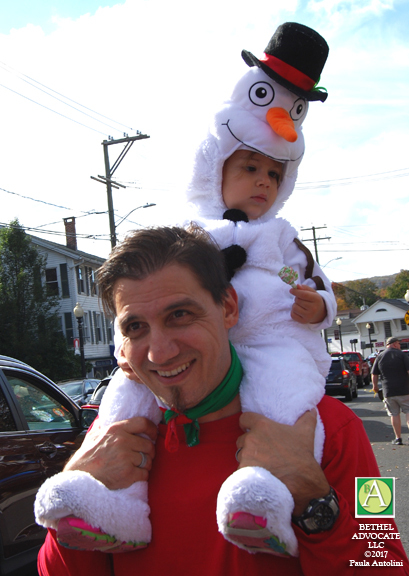 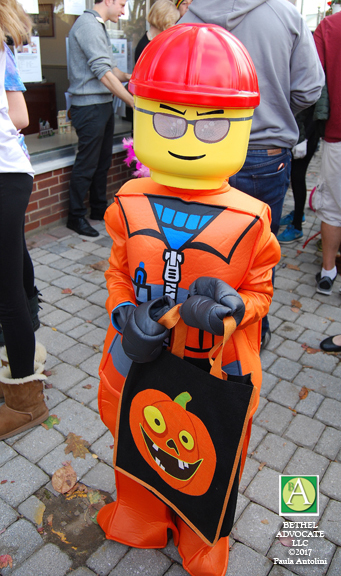 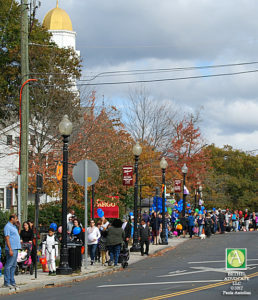 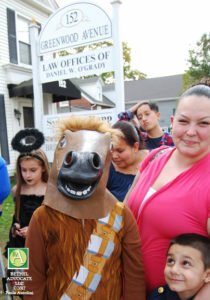 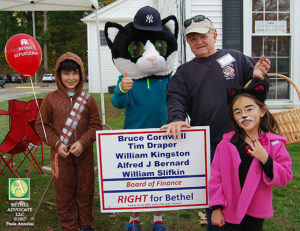 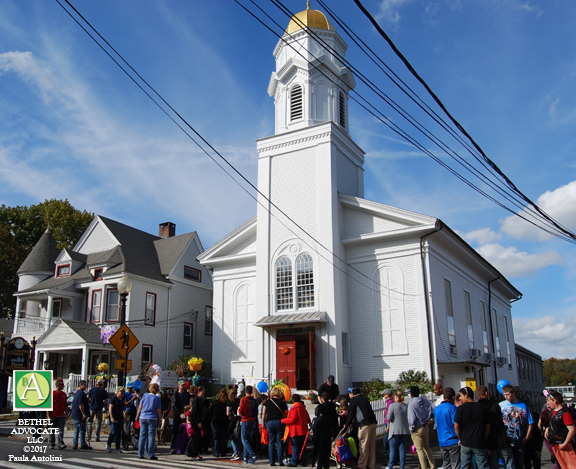 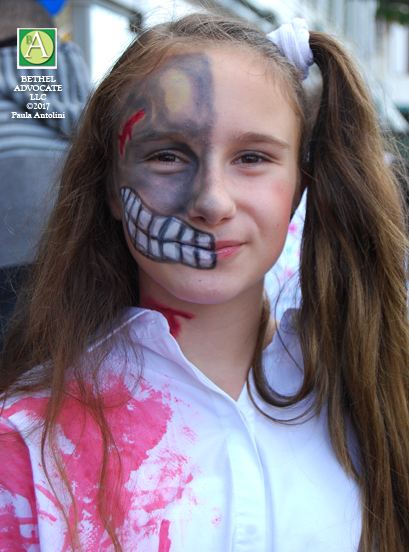 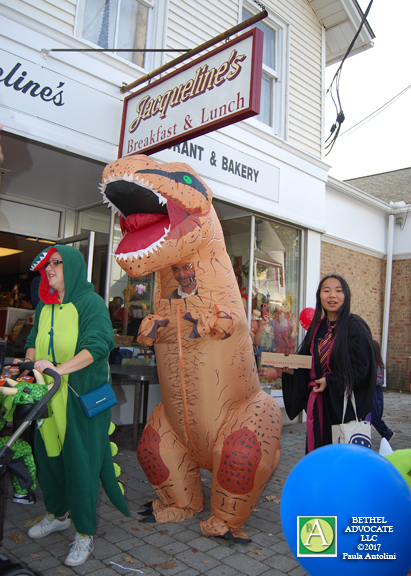 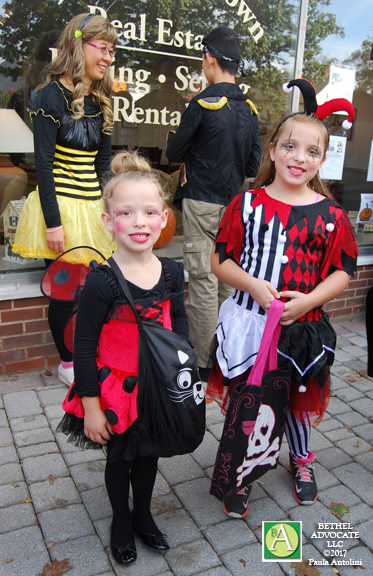 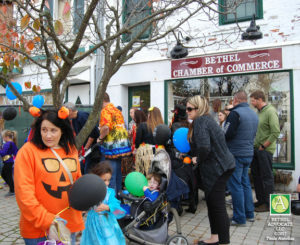 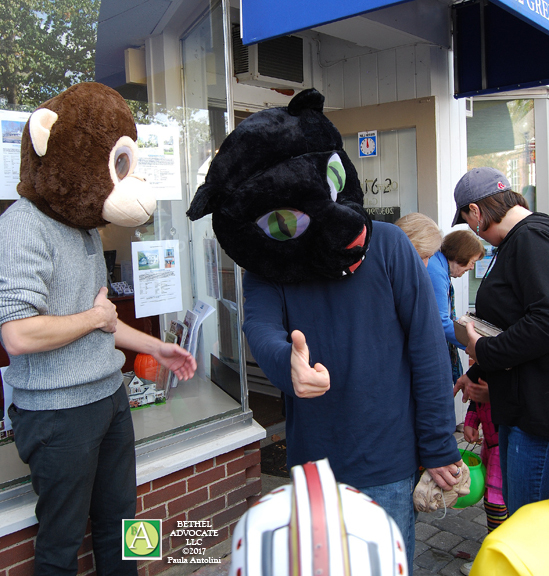 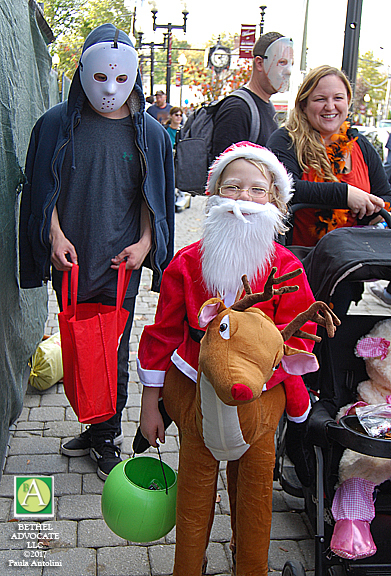 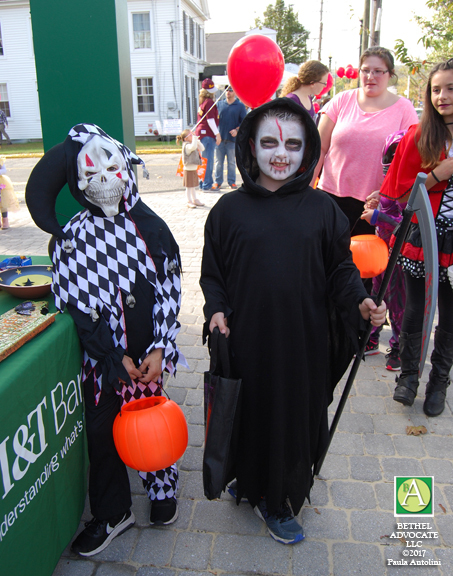 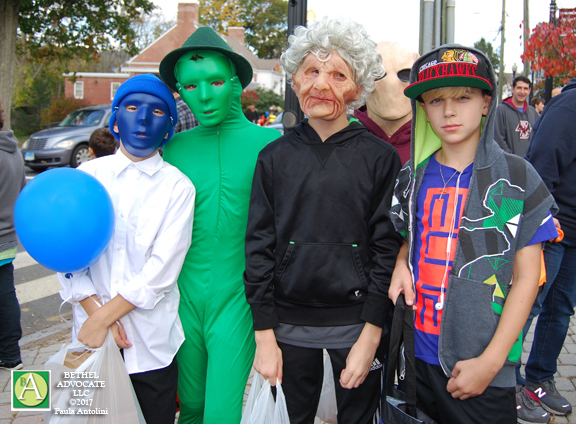 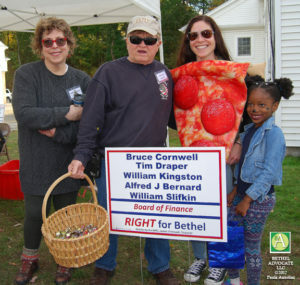 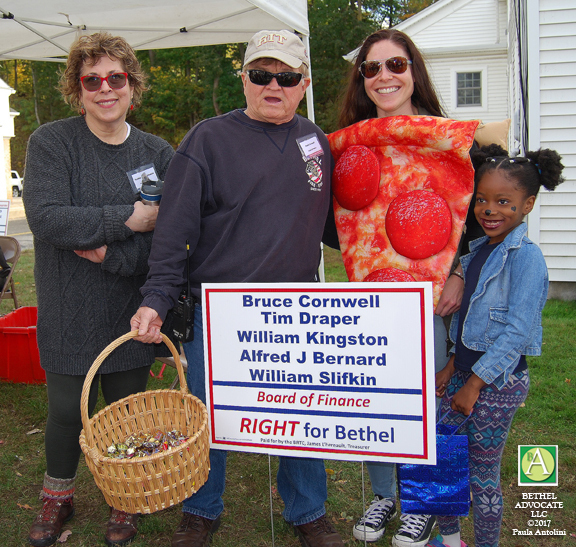 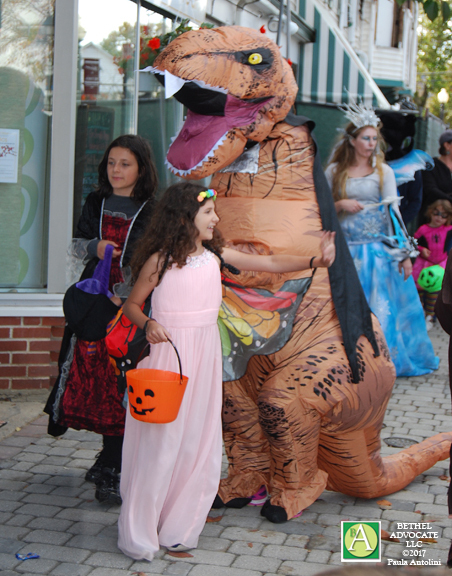 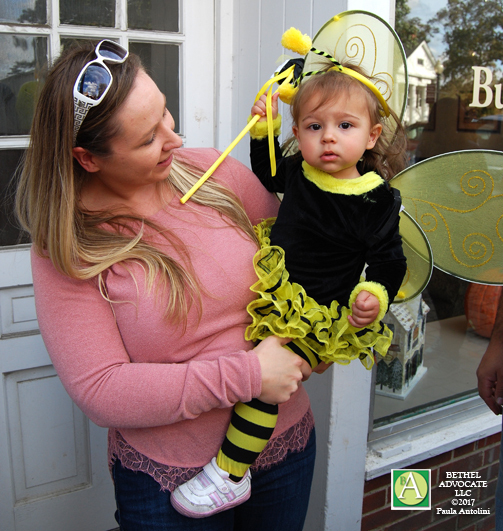 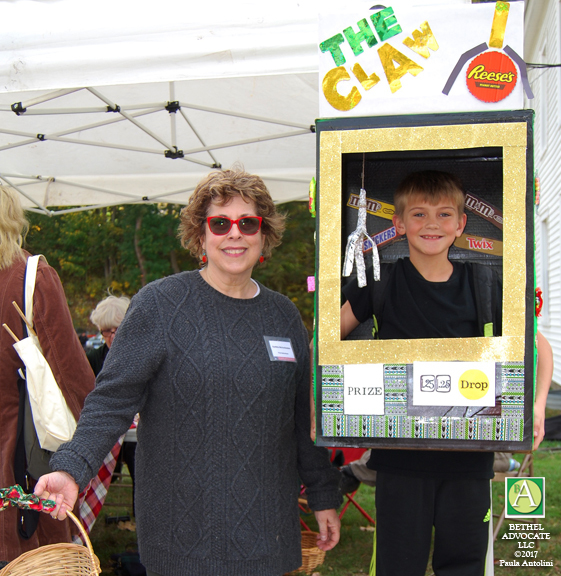 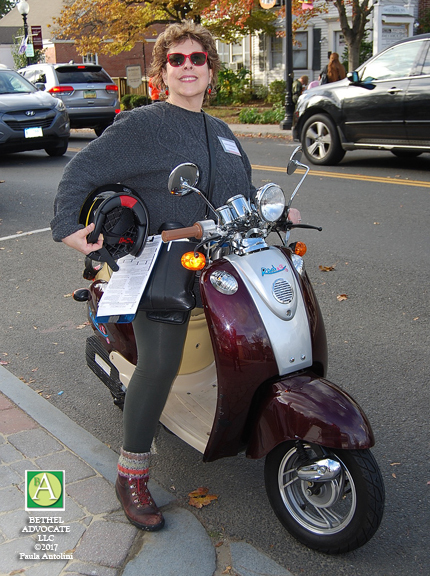 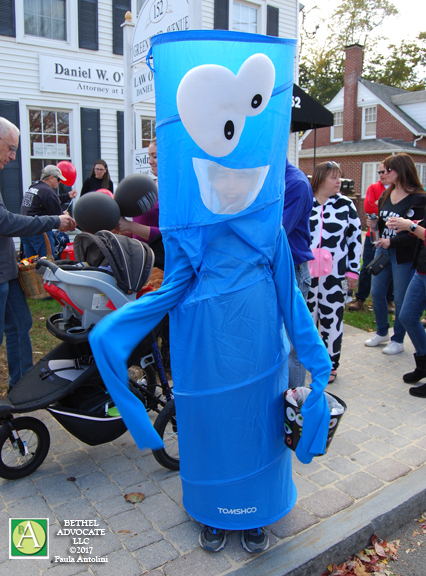 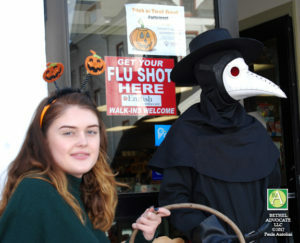 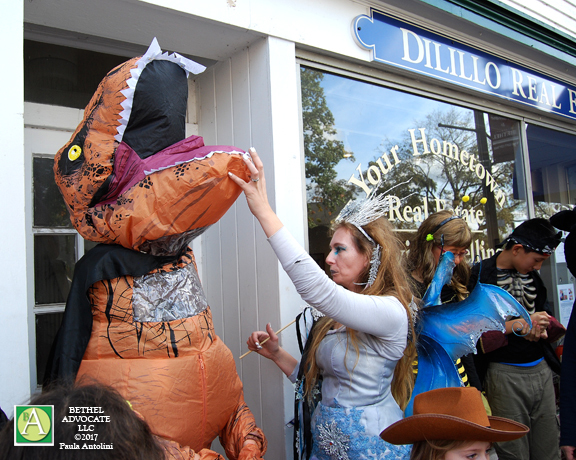 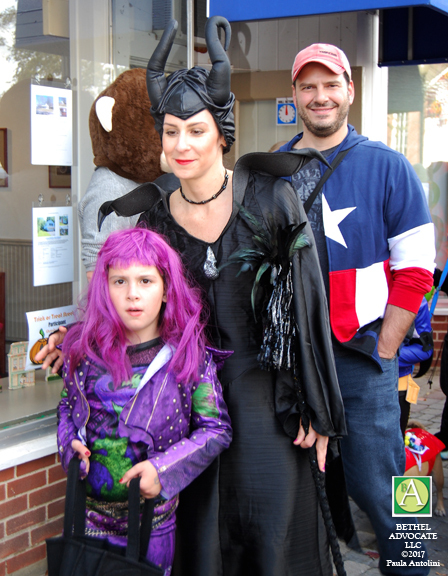 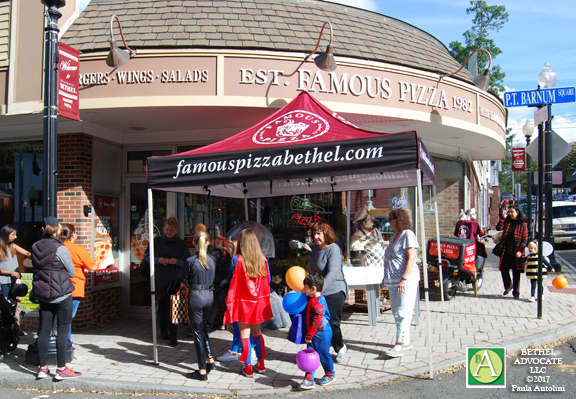 A few thousand people poured into Bethel on a breezy fall afternoon for Trick or Treat Street on October 28, 2017, an event organized by the Bethel Chamber of Commerce and supported by Bethel businesses. 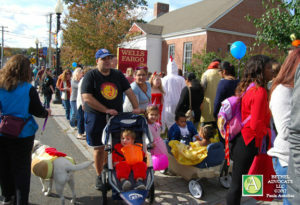 The day began with a Magic Show by Danny Diamond, inside the CJH Municipal Center gym, and ran from 12 noon to 1:00 p.m.
Attendees could “B.Y.O.V.”(bring your own vinyl) on the CJH Municipal Center lawn and be entertained by DJ Donny Dizzle from 1:00 p.m. to 4:00 p.m. 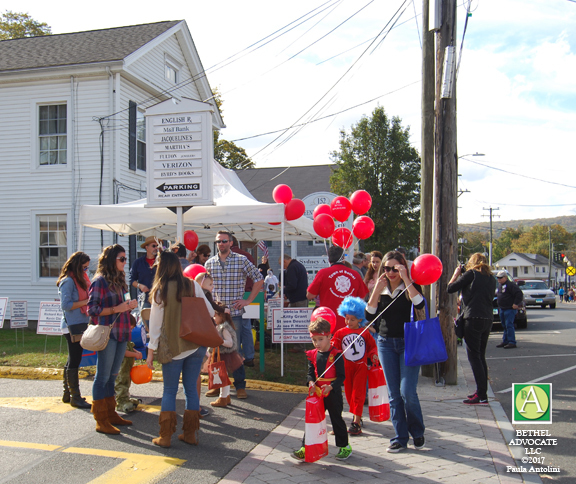 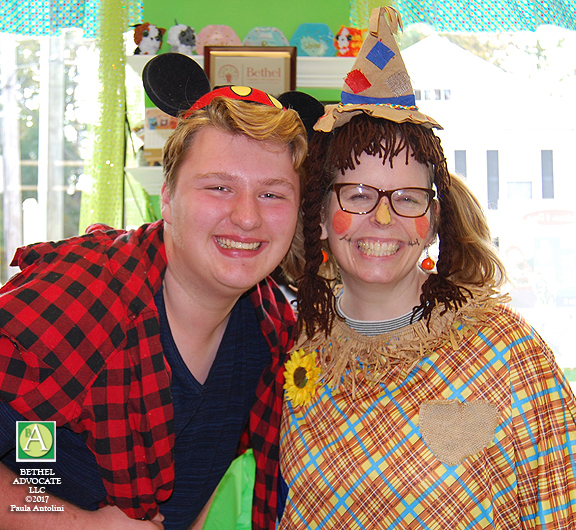 There was also a bounce house, pumpkin decorating, games, activities and a performance by Doherty Petri Irish Dancers, apples, donuts & hot cider. Attendees could visit Small Town Studio’s Station to have their picture taken and emailed to them. 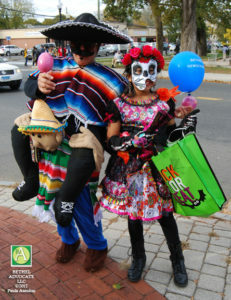 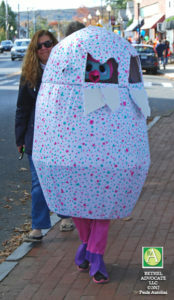 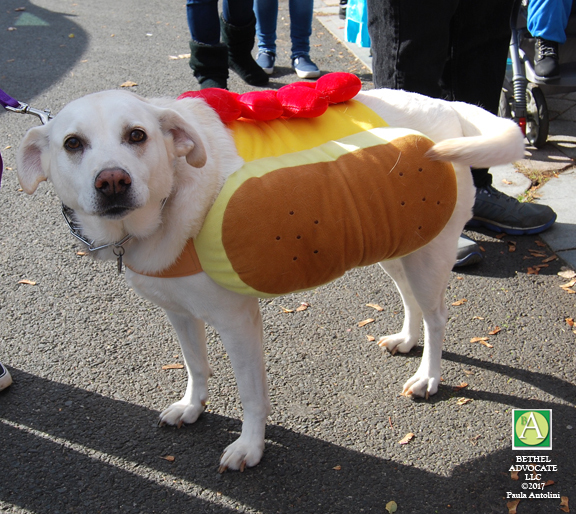 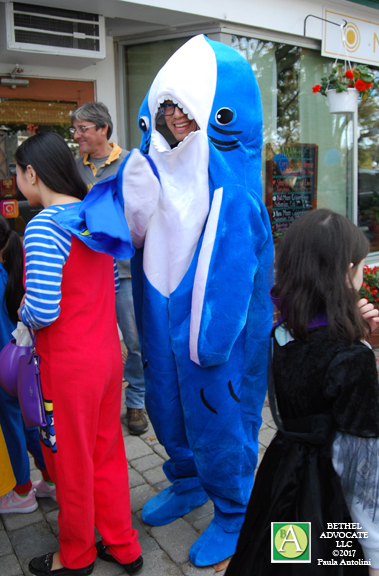 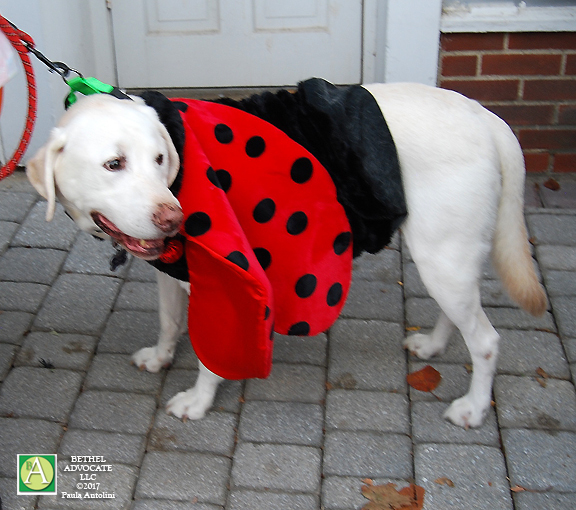 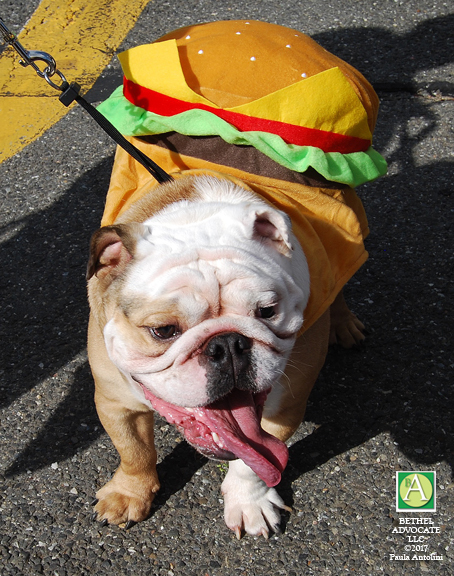 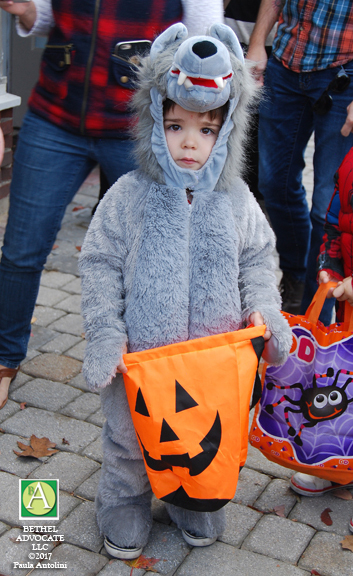 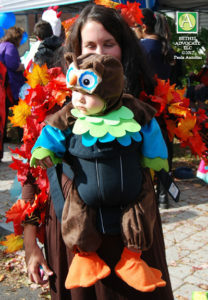 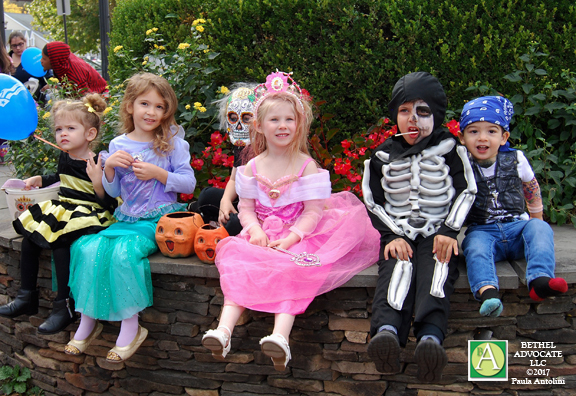 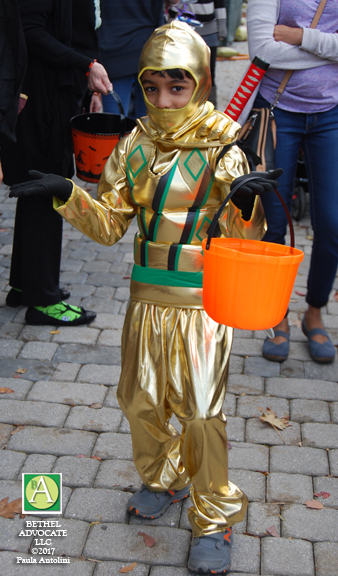 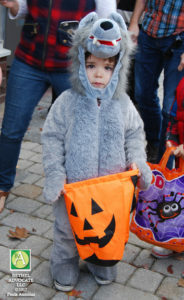 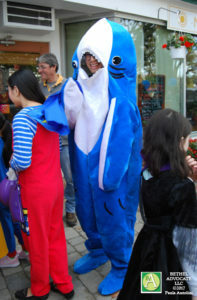 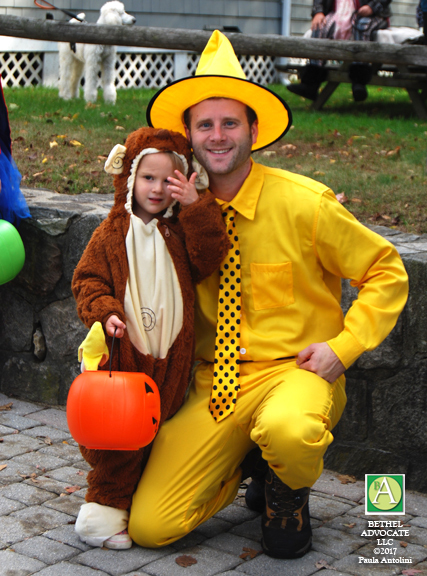 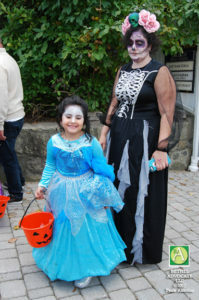 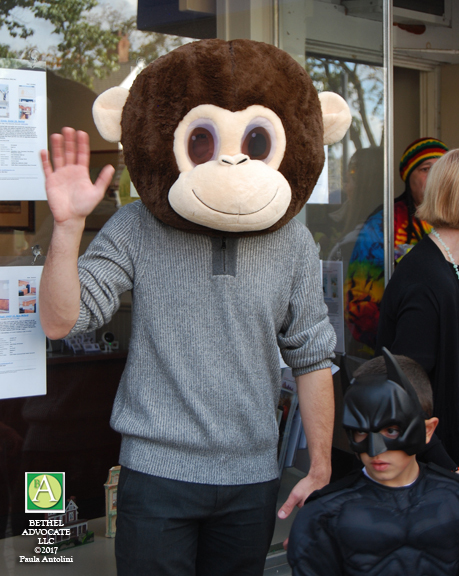 There were Costume contests for Children, Parents and Pets on the CJH Municipal Center lawn at 3-4:00 p.m. 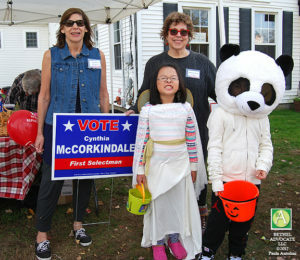 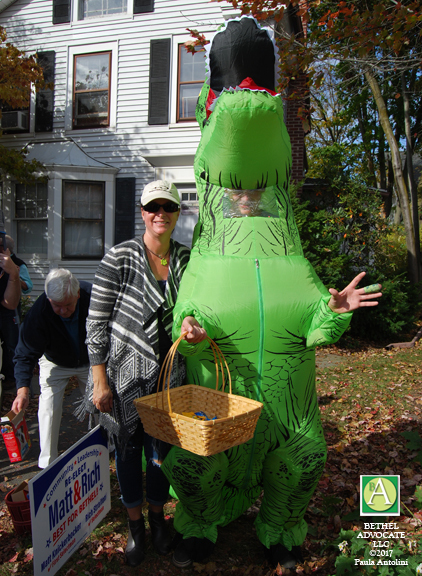 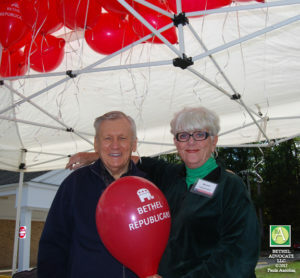 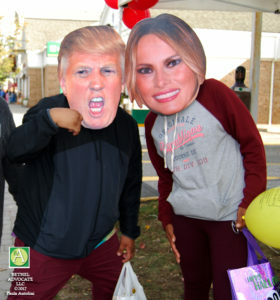 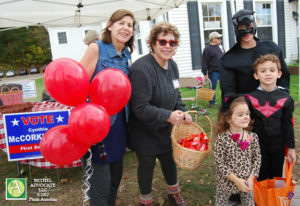 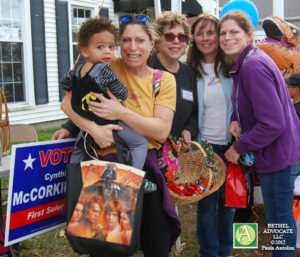 Both the Republican Party and Democratic Party had tents along Greenwood Avenue and candidates were helping to give out treats and balloons to attendees. 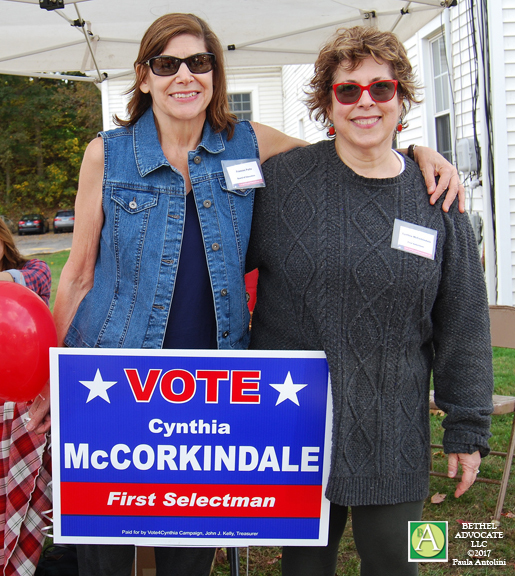 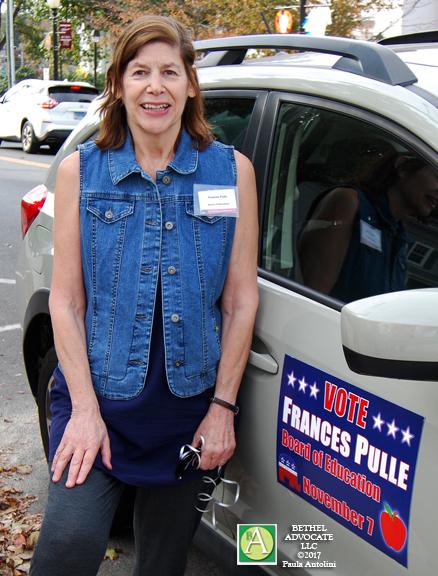 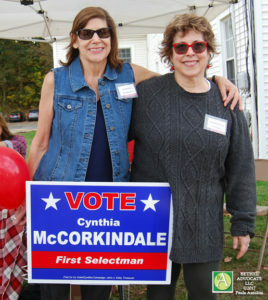 We chatted with the two candidates for First Selectman, Matt Knickerbocker (Democrat, running for reelection) and Cynthia McCorkindale (Independent, cross-endorsed by the Republican Party). Many other candidates were also available to meet and greet. We are looking forward to next year’s event already! 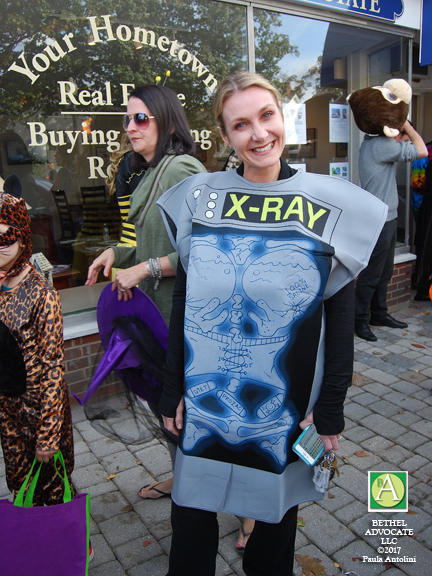 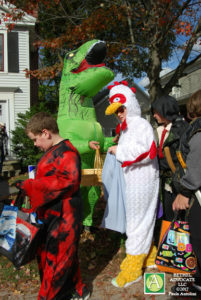 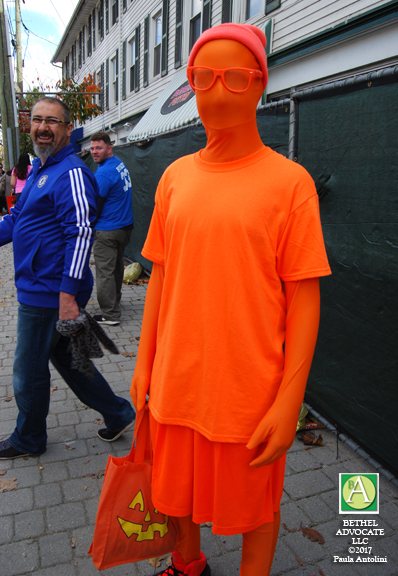 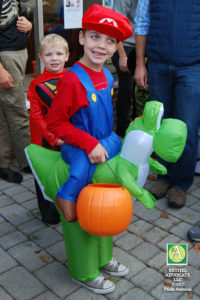 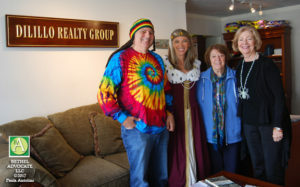 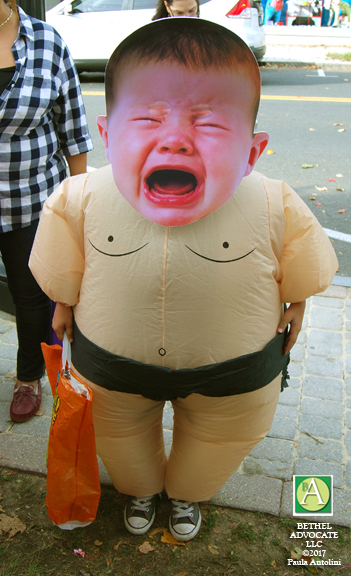 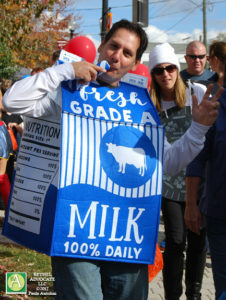 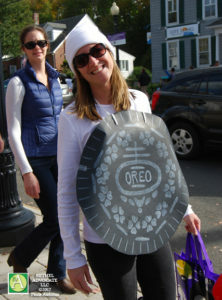 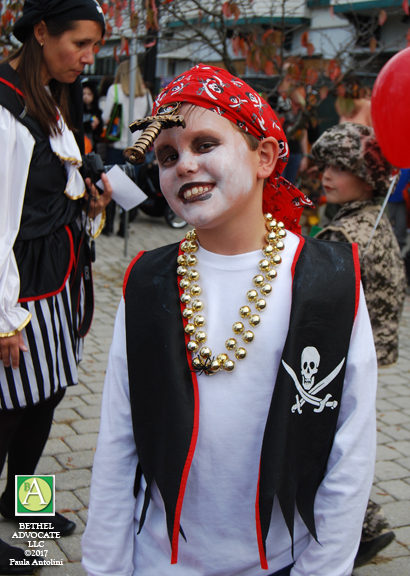 View photos below to see the creative costumes! 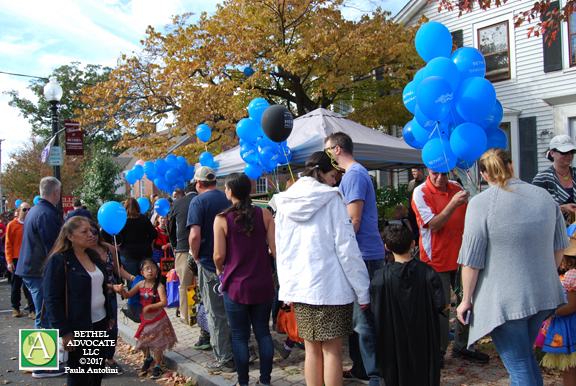 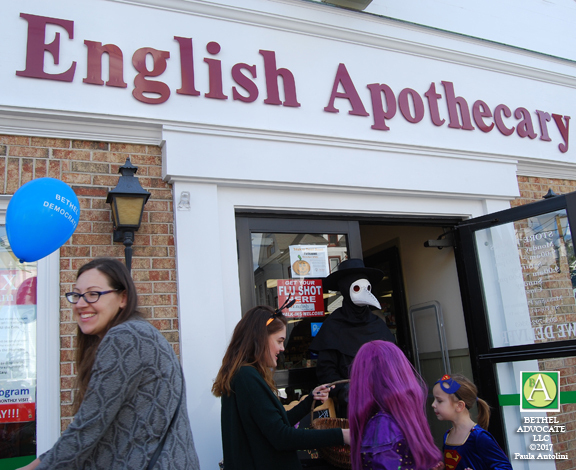 Trick or Treat Street this weekend wouldn’t be the same without the generosity of our sponsors! A BIG THANK YOU to: Bart’s Tree Service, Famous Pizza, Newtown Savings Bank, Regional Y, KMan Glass, Escape Salon, Memry, Insurance Financial Svcs, Union Savings Bank, Wells Fargo, Caraluzzi’s, AFC Urgent Care, Brennan Purdy State Farm, Blue Jay Orchards, Berkshire Corp Park, Small Town Studio, Mad Hatter Moon Bounce, Hollandia Nurseries, Belardinelli Tire, Epic Driving School, The Toy Room, Doherty Petri Dance, Bark & Run Doggie Camp, Elite Dental, Redwood Construction, Bethel Education Foundation, McCollam Insurance, Edward Jones, and j. lawrence downtown!! 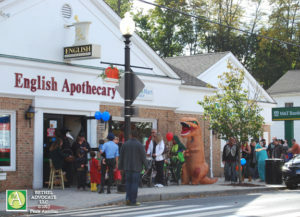 Our local businesses rock!